Nancy Howells is a self-taught mosaic artist, initially inspired to her chosen work by the mosaics she saw during her travels in Spain, Australia, and the American Southwest. She expresses her playful vision using her handmade tiles and broken plates to cover everything from shoes to large installation sculptures of furniture and whimsical animals. Nancy's work has been displayed in a number of galleries from San Francisco to Pacific Grove since 1994, and also at the San Jose Museum of Art. 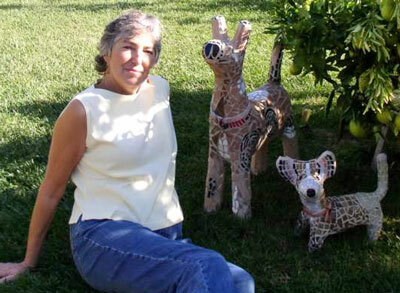 Her studio, where she creates her handmade ceramic pieces, and teaches classes in mosaic art, is at her home in Santa Cruz. You may contact Nancy Howells by email at howelln@cruzio.com. Or you may call the Painted Chair Studio at (831) 425-1602. Be sure to read Santa Cruz Sentinel article... "Injecting Creativity into your life and work"
Available for an artful friend or family member.